Why Can’t My Dog Be Alone? A common complaint of new pet parents is that their pups are destructive or disruptive when left alone at home. While these problems may just be a sign that your dog needs to be taught polite house manners, they can also indicate an anxiety disorder called “separation anxiety.” This disorder is triggered when dogs become upset because of separation from the people they’ve become attached to. Escape attempts by dogs with this problem can result in self-trauma and destruction of window, doors, and walls in your home. Many veterinary behaviorists believe that dogs with this particular disorder may have been weaned too early from their mothers, or the mothers became unavailable to the puppies due to illness or death. In other situations, the mother dog may have neglected or rejected the anxious puppy, or provided little physical stimulation. For example, if your pet loves to play with a particular toy or eat a certain treat food, you can offer your dog a rubber Kong toy stuffed with peanut butter or low-fat cream cheese to puzzle through when you leave the house. That should keep her occupied for 20 to 30 minutes and allow her to relax when you are gone. Make sure to pick up the toy when you return and don’t give it to her unless you are leaving the house. She needs to be able to associate you being absent with her getting her toy and her favorite food in order to become less anxiety prone. For more moderate to severe cases of separation anxiety, you will need to desensitize your pet to whatever action initiates the agitation and recondition her to accept that being alone can bring good things instead of fear and apprehension. For example, if you notice that she gets anxious and begins whining whenever you put on your coat to go outside, put on your coat, give her a treat and some attention, and don’t leave the room. Do this several times over a period of days until she is no longer showing anxiety when she sees your coat. The next step in her training is for you to put on your coat, give her a treat and some attention, then quickly go out the front door and stay out for just 3 to 5 seconds. Come back in, praise and reward her, then take off your coat and stay. Practice this maneuver until she is no longer anxious, and then begin lengthening the time you stay outside until you can go out without any reaction at all from her. This entire training process can last anywhere from a week to several months, depending on the severity of your dog’s anxieties. 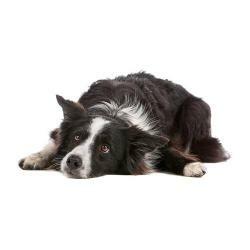 Your veterinarian may be able to help calm some of your dog’s fears by using prescribed anti-anxiety medications. Some pets become so agitated at the thought of being away from their owners that medication is necessary before any training and reprogramming can be undertaken. Don’t scold or punish your pooch for behaviors she can’t help. Her responses are results of stress from being left alone and NOT from spite or disobedience. Punishment can cause the problem to get much worse. Please Note: Consult your veterinarian before giving your pup any anti-anxiety medications. If training at home isn’t working, a veterinary behaviorist who can work with both you and your dog may be just what you need to overcome this problem.